» What Are CFS and Fibromyalgia? » What Causes These Illnesses? » CFS and Fibromyalgia Are Treatable! » D-Ribose—An Exciting New Discovery! » How Do I Make My Pain Go Away? What Are CFS and Fibromyalgia? Chronic fatigue syndrome (CFS) and its painful cousin fibromyalgia (FMS) are chronic health disorders characterized by a mix of severe exhaustion, insomnia and "brain fog" symptoms. In fibromyalgia, widespread pain is also present. There are literally dozens of other symptoms as well. CFS's cousin, fibromyalgia syndrome, is characterized by severe pain—sometimes all over the body and sometimes only in specific areas. These painful areas can be transient or persistent. FMS pain is initially caused by a shortening or tightening of the muscles caused by decreased energy in the body. It's similar to the way your muscles get tight after a heavy workout. Restoring energy production is the key to helping the muscles relax and the pain to go away. The chronic muscle pain also triggers nerve pain and central sensitization, which results in a feeling of "brain pain." There are actually seven distinct types of pain in fibromyalgia, all of which can be effectively treated. Although there are dozens of health tests that can be performed that will reveal abnormalities that indicate fibromyalgia, I don't find any of them necessary for making the diagnosis. The combination of inability to sleep despite being exhausted, feeling brain fogged, and experiencing widespread pain is generally enough to indicate fibromyalgia. The health organizations CDC and ACR have established a checklist of criteria that can assess the possibility that you have either of these illnesses. If you'd like to see what this checklist predicts for you, take the CFS/FMS Checklist quiz here at our site. Although medical testing is not absolutely necessary to make the diagnosis, very thorough testing is needed to determine the underlying causes of the illness in order to design an effective treatment protocol. CFS/FMS acts as a "circuit breaker," with the hypothalamus decreasing its function to protect the individual in the face of what is perceived to be an overwhelming stress (just like blowing a fuse/circuit breaker in a house). This center controls sleep, hormones, temperature, and blood flow/blood pressure/sweating. When you don't sleep deeply, your immune system also stops working properly and you'll be in pain. In addition, if your muscles do not have enough energy, they will get stuck in the shortened position, also contributing to pain (think rigor mortis). This "energy crisis" can be caused by any of a number of infections, stresses or injuries. Some of you had your illness caused by any of a number of infections. In this situation, you can often give the time that your illness began almost to the day. This is also the case in those of you who had an injury (sometimes very mild) that was enough to disrupt your sleep and trigger this process. In others, the illness had a more gradual onset. This may have been associated with hormonal deficiencies (e.g., low thyroid, estrogen, testosterone, cortisone, etc.) despite normal blood tests. In others, it may be associated with chronic stress, antibiotic use with secondary yeast overgrowth, and/or nutritional deficiencies. Indeed, we have found dozens of common causes and factors that contribute to these syndromes. Understanding this helps us understand the symptom complex seen in CFS/fibromyalgia. Restoring energy production so that your hypothalamic "circuit breaker" turns back on, and eliminating what blew your fuse in the first place, also gives us many ways to effectively treat you! CFS and Fibromyalgia Are Treatable! For years, many of us have dreamt of the day when we would see the headline "Effective Treatment for Chronic Fatigue Syndrome and Fibromyalgia Discovered!" We are very excited to report that that day has arrived! One of our studies published in the Journal of Chronic Fatigue Syndrome is titled "Effective Treatment of Chronic Fatigue Syndrome and Fibromyalgia — the Results of a Randomized, Double-Blind, Placebo-Controlled Study." After decades of hard work by hundreds of researchers in the field, we have progressed to the point where effective treatment is now available for these illnesses! In our study, 91% of patients improved with treatment. After two years of treatment, patients typically saw an average 90% improvement in quality of life. Pain decreased by an average of over 50%. Many patients no longer even qualified for the diagnosis of CFS or fibromyalgia after treatment! Interestingly, many of the same principles for treating fibromyalgia also apply to muscle pain. That the vast majority of patients improved significantly in the active group while there was minimal improvement in the placebo group proves two very important things. The first is that these are very treatable diseases. The second is that anyone who now says that these illnesses are not real and are just "all in your head" are clearly both wrong and unscientific. It's important to recognize that these syndromes can be caused and aggravated by a large number of different triggers. When all these different contributing factors are looked for, and treated effectively, patients improved significantly and often get well! Americans are suffering an energy crisis, with 31% of adults having severe fatigue. Virtually everybody would like to have more energy. To turn your "circuit breaker" back on, help your muscles relax, and improve overall energy and vitality, follow the S.H.I.N.E.® Protocol! Most people with these illnesses find that they are unable to get 7-8 hours of deep sleep a night without taking medications. In part, this occurs because hypothalamic function is critical to falling and staying asleep. Unfortunately, many of the most common sleep medications actually aggravate sleep problems by decreasing the amount of time spent in deep sleep. To get well, it is critical to take enough of the correct sleep herbals and medications to get 8 to 9 hours of deep sleep at night. The medications often work best at very low doses. These include Ambien, Desyrel, Neurontin, Zanaflex and Flexeril. In addition, natural remedies can help sleep. An excellent herbal sleep mix called the Revitalizing Sleep Formula includes the herbs Theanine, Lemon Balm, wild lettuce, valerian, passion flower, and hops. Other natural sleep aids include a mix of essential oils called Terrific Zzzz™, as well as 5-HTP (300 mg a night) and melatonin. Some find that over-the-counter antihistamines such as doxylamine (Unisom for sleep) or Benadryl can also help. In the first six months of use, it is not uncommon to sometimes need to take even six to eight different sleep support products simultaneously to get eight hours of sleep at night. After 6-18 months of feeling well, most people can come off of most sleep (and other) medications and supplements. The hypothalamus is the main control center for most of the glands in your body. Most of the normal ranges for blood tests were not developed in the context of hypothalamic suppression or these syndromes. Because of this (and for a number of other reasons) it's usually necessary, albeit controversial, to treat with thyroid, adrenal (very low-dose cortef; DHEA), and ovarian and testicular hormones—despite normal blood tests! These hormones have been found to be reasonably safe when used in low doses. Many studies have shown immune system dysfunction in CFS/FMS. Although there are many causes of this, I suspect that poor sleep and inadequate zinc levels are 2 (of many) major contributors. The immune dysfunction can result in many unusual infections. These include viral infections (e.g., HHV-6, CMV, HSV-1 and EBV), parasites and other bowel infections, infections sensitive to long-term treatment with the antibiotics Cipro and Doxycycline (e.g., mycoplasma, chlamydia, Lyme) and, most importantly, fungal/Candida infections. Avoiding sweets (stevia is OK) and taking probiotic pearls (healthy milk bacteria in a special "pearls" coating) can be very helpful. I also recommend adding prescription antifungals. Vitamins — especially the B vitamins, vitamin B12 and antioxidants (e.g., vitamin C and E). Minerals — especially magnesium, zinc and selenium. Energy Revitalization System or Daily Energy Enfusion vitamin powder (one half to one scoop daily). S.H.I.N.E.® D-Ribose powder. (one 5 gm scoop three times a day for three weeks and then twice a day, or even just once a day added to the vitamin powder). Coenzyme Q10 (200 mg each morning). Vectomega (one a day; this replaces seven large typical fish oil pills). Decreased activity causes deconditioning. Pushing too hard, though, causes "postexertional fatigue," where you feel like you were hit by a truck the following day. So the proper balance is to do a level of walking that leaves you feeling "good" tired afterwards and better the next day. After 10 weeks on S.H.I.N.E., your energy levels will usually increase markedly, allowing you to condition instead of simply crashing after exercise. S.H.I.N.E.® D-Ribose is an outstanding new nutrient (a special sugar — even OK for those who need to avoid sugar) for those of you who want a powerful energy boost. In addition to its role in making DNA and RNA, those of you familiar with biochemistry remember Ribose as the key building block for making energy. In fact, the main energy molecules (like "energy dollars") in your body (e.g., ATP, FADH) are made of ribose plus B vitamins/phosphate. That makes these energy molecules similar to the paper that money is printed on—kind of like being able to print your own energy currency! D-Ribose has many uses, including treating heart muscle weakness. We were so impressed with this product that our research center has done 2 studies looking at ribose in CFS/FMS, with the most recent study being a multicenter study. In the study, 257 people were treated at 53 clinics. On average, they showed a 61% increase in energy at just 3 weeks! Pain, sleep and "brain fog" also improved. How Do I Make My Pain Go Away? Pain is very responsive to treatment! In many cases, it usually will improve dramatically and often even go away if you simply get the eight hours of sleep a night I discuss above, take a good vitamin powder plus ribose, take thyroid hormone, and treat the underlying yeast infections. Other patients require more thorough evaluation and treatment. Localized myofascial pain also requires an evaluation for structural causes. Curamin. This herbal mix has been a pain relief miracle for people. Take 1 to 2 tablets twice daily and give it six weeks to see the full effect. These three can all be used together and in combination with any pain medications. Tramadol (Ultram). Although regulated as an addictive medication, I've never seen anyone become addicted to this medication. The main problem is that it cannot be used in combination with low-dose naltrexone. Low-dose naltrexone. Made by compounding pharmacies, at a dose of 3-4.5 mg a night, after two months use it can result in marked improvement. This has been documented in several fibromyalgia studies. Flexeril (cyclobenzaprine) 2 ½-5 mg three times daily. Compounding pharmacies (e.g., ITC Pharmacy 303-663-4224 ) can guide your physician on prescribing topical pain creams creating a mixture of medications, which can be highly effective for local areas of pain without significant side effects. There are literally dozens of other helpful pain treatments as well. For more information, see "Prescription Relief for Chronic Fibromyalgia Pain." There are many other helpful natural therapies, medications and other effective ways to help manage pain. These can be used to help keep you comfortable while we go after the pain's underlying causes. I treat patients worldwide. Consultations can be done in person or by phone. Email Sarah at appointments@EndFatigue.com for more information. My best-selling books The Fatigue and Fibromyalgia Solution, From Fatigued to Fantastic! (the #1 best-selling book of all time on CFS and fibromyalgia), and Pain Free 1-2-3 can supply you and your physician with all the information that you need to get treated effectively. 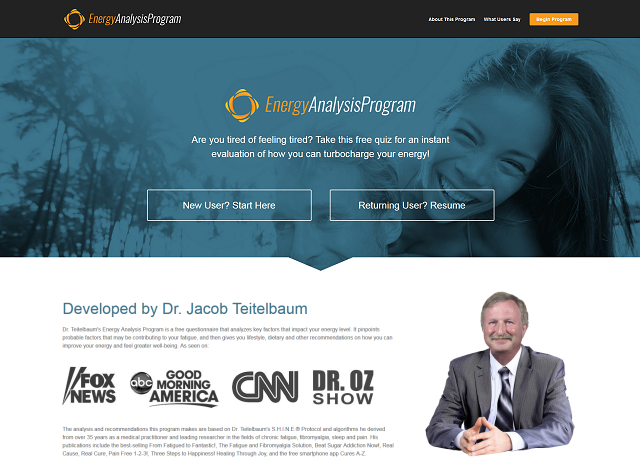 The free "Energy Analysis Program" can help you learn how to optimize your energy production. This 10 minute online quiz (which even analyzes pertinent lab tests if available) applies the S.H.I.N.E.® Protocol to create a specific set of recommendations for improving your energy level. Our goal is simple. We want everyone to be able to get their lives back — NOW!